Guest post by Daniel Lombardi. This post was originally published on WhyDev, and has been reposted with permission. 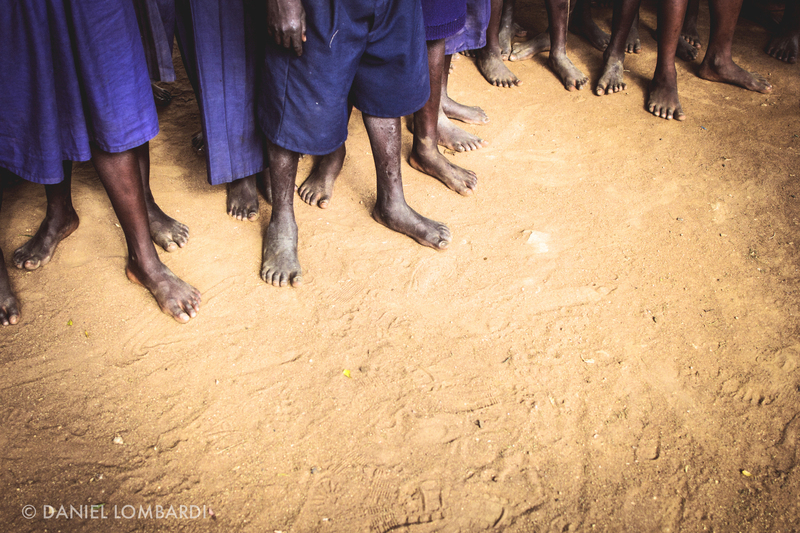 Barefoot students at St. Stephens Buloosi Primary School in Bumula, Kenya. Photo by Daniel Lombardi. NGOs are often faced with incentives to tell stories on the extreme ends of the emotional spectrum. Some organisations try to make their stories extremely happy and uplifting, to excite their audiences into action. Other times, the pressure is to tell stories that are incredibly bleak and dark, in the hopes of scaring the audience into action. All of this is despite the fact that the best stories have both dark and light shades in them. Whether the story is a comedy, a tragedy, or mindlessly happy is second to its quality. Like Quist-Arcton says, the most important thing is “telling a good tale,” and then – if the story is a good one, whether it’s dark or light – listeners will perk up and get invested in it. Susan Moeller makes a similar point in her book Compassion Fatigue: How the Media Sell Disease, Famine, War, and Death. She argues that media coverage of inherently dark subjects need not cause compassion fatigue. Instead, she argues, formulaic and bland journalism is what causes the audience to fatigue. There are lots of problems with stories focusing solely on the positive or the negative, the first being that needlessly dark or mindlessly happy stories are boring! Stories that lack emotional variation feel flat and bland. Obviously a boring story will not be very effective at moving an audience to action, regardless of which narrative it conforms to. Another major problem with stories that focus only on the positive or negative is that they’re likely to oversimplify and leave out important facts. If a development story only tells the happy and hopeful parts, the audience will probably miss significant elements of the issue that are important. Dr. Hawa Abdi: Vital Voices – This quick video is an animated story of Dr. Hawa Abdi’s life in Somalia, narrated by her. There are some dark moments in this story for sure, but the mood changes throughout, and at the end, we are left feeling inspired. Invisible Children: They Came at Night – I think this is Invisible Children’s best video. (And they have produced a lot.) This twenty-minute film tells the story of a young man trying to escape the Lord’s Resistance Army in Uganda, and how escape is not as simple as it sounds. It’s a powerful drama with emotions ranging from hope to fear to anger, to more fear and back to hope again. Girl Rising: The Nepal Chapter – Produced in partnership with Room to Read, this short film uses a young girl’s real-life experiences to tell a powerful story about the importance of girls’ education. It’s part of the full Girl Rising film, which tells similar stories about girls around the world, all of them excellent examples of good story telling. As you might expect, the mood varies between depressing to inspiring. But, this film also has a powerful streak of stubborn determination that is sure to leave you ready to fight. Let me conclude by encouraging you to worry less about creating a particular mood in a story and focus more on telling it well. Whether they’re sad, funny or happy (and the best stories are usually all of the above), quality stories that inspire the audience to action, can really change the world. As storytellers, our role is to honestly do the story justice: tell it well, and with whatever range of emotion exists in reality. Daniel Lombardi is a writer, photojournalist and filmmaker who often produces creative media for humanitarian organizations. You can view his work at www.insearchofthemoment.com. Indeed, good stories grab and hold our attention. If they don’t it doesn’t matter how well-intentioned the organization’s cause or purpose because the opportunity for an emotional bond with the audience is lost. And as Daniel points out, a good one has both emotional lows and highs (Schiller’s struggle and overcoming).